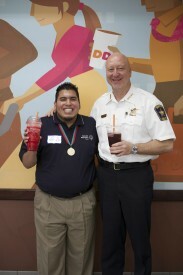 On April 9, Berwyn Chief of Police Jim Ritz and Special Olympics Illinois athlete and Global Messenger Jose Moreno Jr. met at the Dunkin’ Donuts at Cermak Road and East Avenue in Berwyn to share their fondness for Special Olympics and the Cop on a Rooftop fundraiser in front of the cameras as a crew from Dunkin’ Donuts filmed a public service announcement. Jose has been supporting Special Olympics and the Law Enforcement Torch Run at the Cop on a Rooftop event for years. “I usually visit the locations near me – Bensenville, Addison and Elmhurst – and tell the officers who I am and that I appreciate their support of us athletes,” he said. He takes a great deal of pride in being able to thank the members of law enforcement. “They do it for us (athletes). Not many athletes thank them aside from Summer Games, so I make sure to do it at this event,” said Jose. Ritz, who’s been Chief of Berwyn Police Department for 5 years, said his department started a Special Olympics committee three years ago and they began participating in the Dunkin’ Donuts Cop on a Rooftop event that year. Last year, the department raised $5,400 at their local Dunkin’ location. “Our community has been very supportive of our efforts to raise money for Special Olympics,” he said. Join Jim Ritz, Jose Moreno and all the law enforcement officers and athletes around the state on May 29 at a Dunkin’ Donuts near you. See list of locations here.